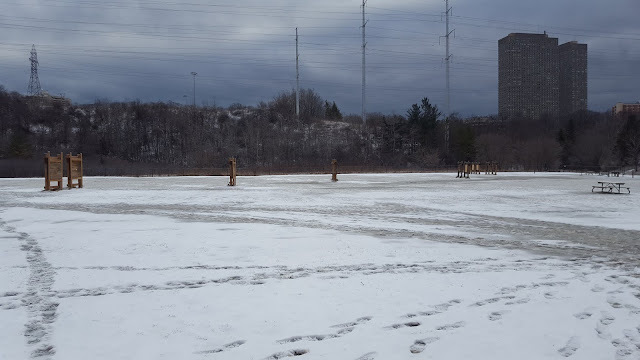 Where to find javelin lessons in Toronto? 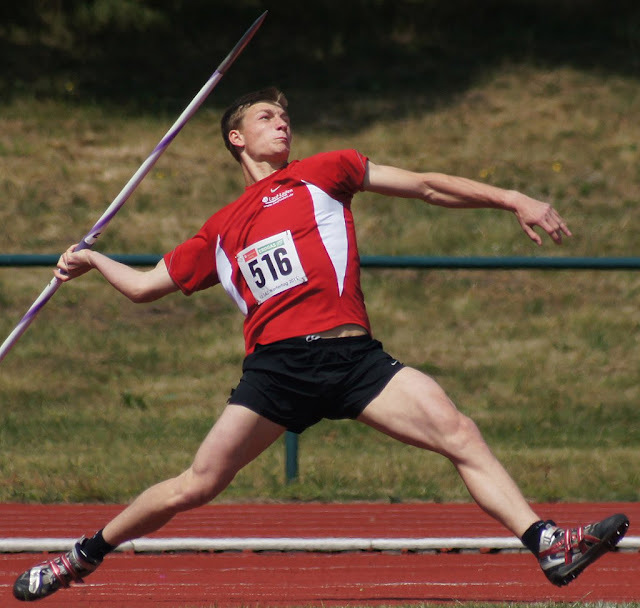 Hello, I live in the beaches area of Toronto and was looking for a contact or someone who can do one-on-one or small group sessions on throwing the javelin. I am an athlete in many sports but haven't had the opportunity to try the javelin. I would like to learn or at least try to see how good I could be in this sport and was hoping to have a few lessons to see if I like it before joining a throwing club and making a big financial commitment. When I was quite young I threw the shot put but that was many years ago. Also throwing the discus might interest me as well. I will be 17 next month and am presently in grade 11 and will be participating in the TDSB track and field team in spring for my school. I usually sprint and compete in the long jump but this year I would like to see if I could participate in the javelin only if I could gain some experience and see if I am good enough through some private or a few group lessons with an experienced thrower. I was hoping you might be able to help me. However I haven't touched a javelin in over 20 years and I am certainly not qualified to teach it. If you wanted archery lessons I could help you, but you don't seem to be interested in that. Although if you are, let me know and we can arrange some archery lessons. My recommendation would be to find someone who competed in javelin, however briefly, and ask if they would be willing to teach a few lessons. Another possibility you might look into, just because it is similar, is spearfishing. I personally think that would be fun to try. Legally, spearfishing in Ontario is governed by the same laws as bowfishing. You might also ask around at various Toronto high schools and see if any of them have a javelin program. There should be a few Phys Ed teachers who teach it. You could also try contacting professional Canadian athletes or their coaches, and ask if they can recommend someone in Toronto. I am going to do a post on my website however and maybe (hopefully) someone will contact me who knows more about teaching javelin, and then I can refer you to them. I really appreciate all your input and information. It's great to hear about your experiences. Thank you very much for your advice and I'll continue to research all avenues and hopefully find someone nearby. 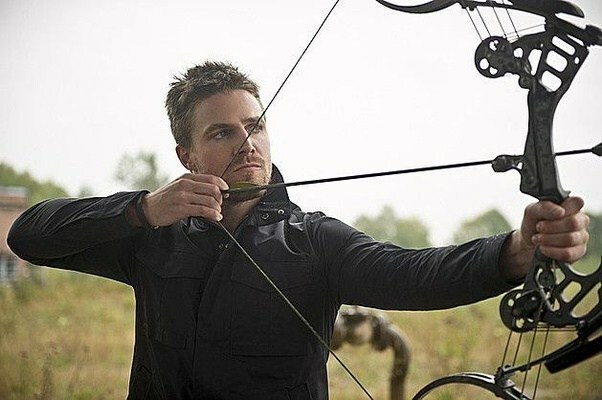 I'm also going to think about the archery. When do you become an archer? "When do you become an archer?" When you first start you become an amateur archer. When you compete, you become a competitive archer. When you get paid to do archery you become a professional archer. When you teach it and people come back for more lessons and tell their friends how great you are, you become an archery instructor (possibly by accident like I did). When you have learned everything in terms of the physical aspects of archery and have to constantly challenge yourself mentally, you have become an archery master. The master already knows how to shoot. That is not their problem. Their problem is finding challenges (often mental challenges) that allow them to continue learning something new. A round of shots on January 24th 2019. The one shot clipped a nock and the nock went flying off. Now you will notice that, yes, that is a very tight cluster. And yes, I did clip the nock so that it went flying off. But what you might not notice is the date. January 24th and it was freezing cold outside. Here is some more photos from that day. To shoot that well in those conditions... it is mostly mental. Eventually it got so cold I decided to go home. 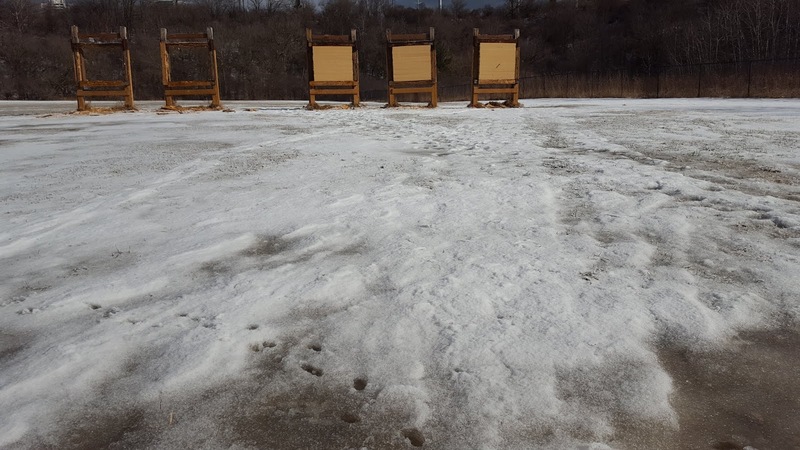 Panarama of the Toronto Archery Range! "Hi I came across an old post about archery ski instruction out of Toronto. Wondering if you’re still coaching or if you can point me in the direction of someone who is in the Toronto area (or somewhere within a drive ). Yes, I still coach that but only on weekends. Would you like to book for January? If you have any questions feel free to ask. Have a good day! So yes, I still teach Archery Biathlon - but I rarely get requests for that. Not many people want archery lessons during the winter, and even less are interested in learning the sport of Archery Biathlon. So E's email made me realize I should do a post that confirms, yes, I do still offer archery biathlon lessons (and winter archery lessons), and there has been a few changes and I do want to remind people of the following. #1. I only teach Archery Biathlon during the weekends. #2. Winter Archery Lessons are likewise only available on weekends. #3. Winter lessons of either are one-on-one only. No pairs or groups of 3. #4. You will need your own skis and ski gear. I do not provide those for you. I only provide the archery equipment, if you need it. If you have your own archery equipment and prefer to use it, that is fine too. #5. Remember to dress for the weather, using multiple tight-fitting layers of warm clothing. Avoid bulky sleeves and bulky jackets. #6. Definitely remember to bring a hot drink with you. Snacks are a good idea too. Lesson 1 will include a Safety Lecture, Eye Dominance Test, Lecture on Aiming, Lecture on Proper Form, Archery Biathlon Practice combined with Field Archery Practice (aka "Field Archery Biathlon"). 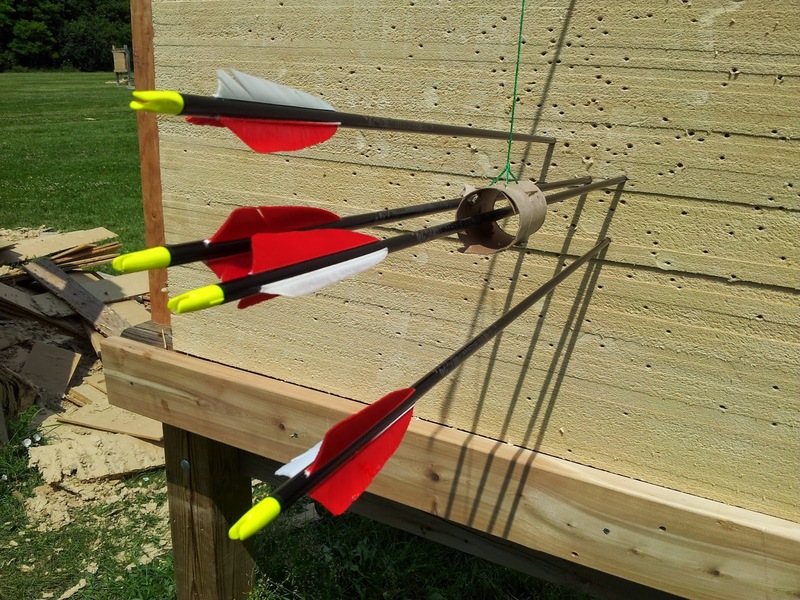 Lessons 2 will start with "Target Archery Biathlon", and include a lecture in the middle about arrowheads. Lesson 3 will focus on "Long Distance Archery Biathlon", and include a lecture in the middle about arrow spine. Lesson 4 will introduce how to use a Sight and Stabilizer and focus on "Target Archery Biathlon". At some point during the lesson we will be waxing the bowstring and waxing the skis. Lesson 5 will focus on "Archery Biathlon Speed Shooting" - because it is fun, and why not do something fun for the final lesson? 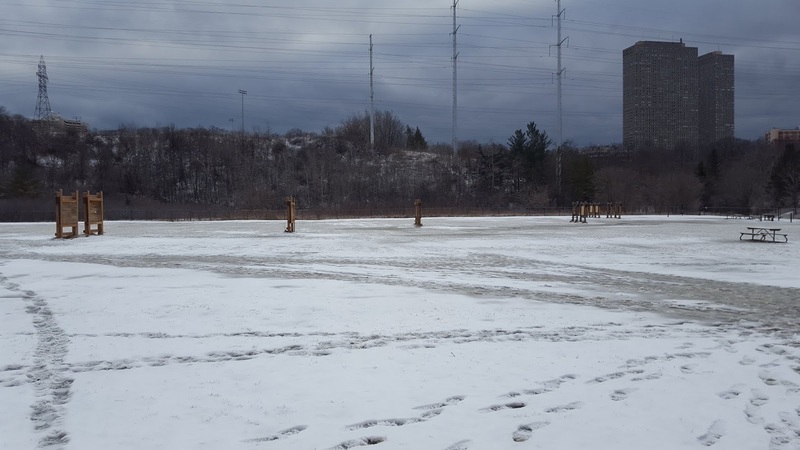 How many lessons a person signs up for is up to them, but we should be able to schedule in 5 lessons during January / February when there is ample snow on the ground. If the snow starts melting too much towards the end of winter we may simply be doing "archery lessons" and skip the skiing aspect. You notice also that E. asked about other locations where she could learn archery biathlon. 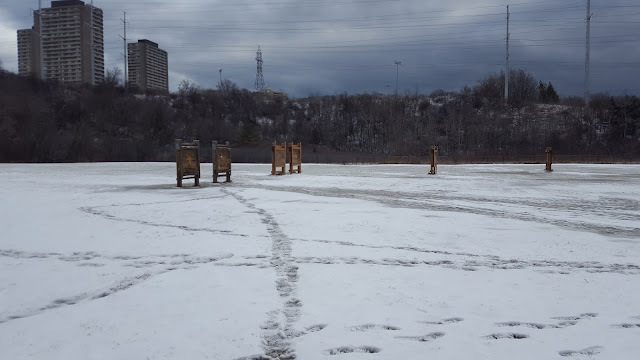 Unfortunately I am unaware of anyone else in Toronto (or remotely near the GTA) who teaches archery biathlon. What is my favourite bow to shoot? 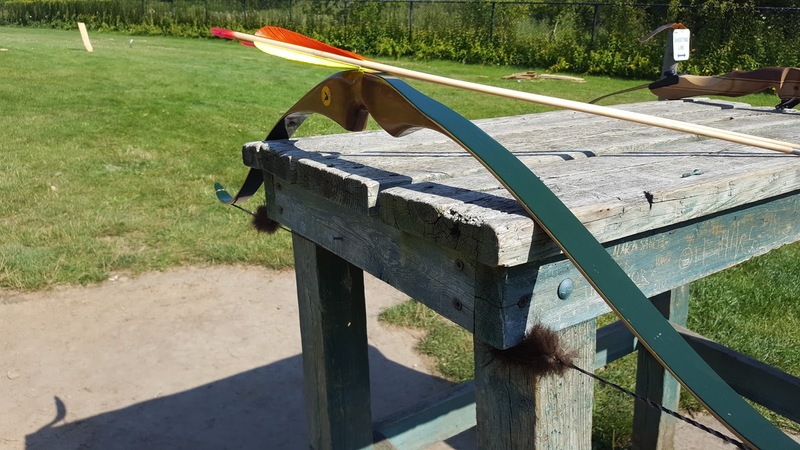 So I was talking back and forth with one of my previous students about archery equipment, answering any and all questions he had, and I mentioned I had recently purchased a vintage bow off eBay, bringing my total number of bows to 32.
" P.S. 32 bows!! At least you must have a sweet collection. Which one is your favorite bow? " I had to seriously think about that question because I had never chosen a favourite out of them. Honestly, very difficult to choose a favourite. It really depends on my mood what I feel like shooting on a particular day. I definitely prefer the older recurves I have collected from the 1970s. I also have other older bows from the 40s, 50s and 60s... the oldest of which is from 1942. Obviously I don't shoot the really old ones that often because I consider them to be "shootable museum pieces", and thus I prefer to only shoot those on rare occasions when the weather is favourable - don't want to shoot them when it is too hot, too cold, or too wet. Of the bows from the 70s my favourite is probably the Black Hawk Avenger from 1972. 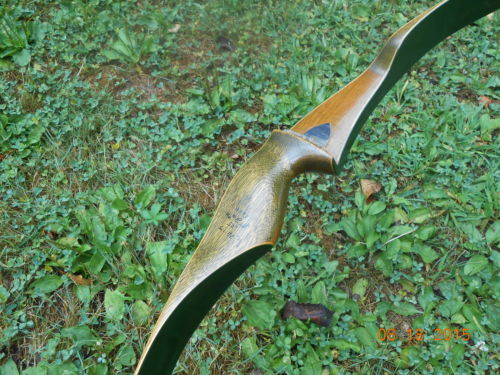 It is a rather pretty "magnum style" recurve. It is called a magnum style because it is shorter and designed for hunters to easily move around with, less worry about it getting caught on branches etc. The problem with that design however is that it makes the bow less forgiving. A longer bow is more forgiving, you can make a mistake and still hit the target. With an unforgiving bow, you make a mistake and miss completely. Thus while it is a small beautiful bow, it is very challenging to shoot accurately and perhaps that is why I enjoy it more - because I like the challenge it presents. Photos below, the Black Hawk Avenger. I really should take more photos of this bow. These photos do not do it justice. I also have a Black Hawk Chief Scout (compound bow) which is the prettiest wooden compound bow I have ever seen. They don't make them like that any more. At what temperature does archery equipment become brittle? 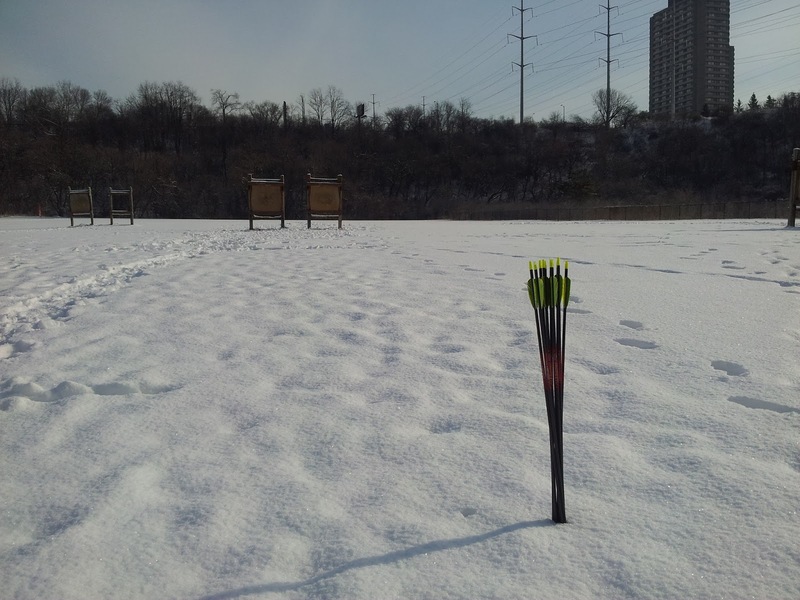 "At what cold temperature does archery equipment become more brittle and more likely to break?" Depends on the material used in the construction of the archery equipment. Carbon Fibre (commonly used to make arrows) becomes brittle at -60° C. So not as much of a concern. Aluminum actually becomes stronger at colder temperatures. It is at high temperatures (above 100° C) that aluminum becomes increasingly weaker. Leather, Feather Fletching, Glues, etc - Honestly, I don't know, but I am going to guess certain glues and epoxies do become brittle at low temperatures and that it varies on the type of glue or epoxy. Leather and feathers I would not worry about. Same goes with plastic fletching, I am going to assume that is pretty durable. Wood is more resistant but not indestructible. It also varies on the type of wood being used, but the rule of thumb is that the harder a wood is, the more brittle it becomes at lower temperatures. So the problem here is that many longbows (and some other styles of bows) use various kinds of hardwood - and that typically the best hardwoods make really good bows. Moisture Content - Because wood contains water, when the water turns into ice it expands - thus damaging the wood itself. The higher the moisture content in wood, the more brittle it can become. Type of Wood - Certain types of wood, like pine or spruce, are excellent for making structures outdoors because they are more resistant to water and ice damage. However pine and spruce is horrible for making bows. In contrast oak, hard maple, and other hardwoods are great for making bows - but are very vulnerable to water and ice damage. Oils and Finishes - This protects the wood from gaining additional water content. A well oiled bow is more protected from water damage and mildew, but that doesn't mean it cannot be effected by ice damage from the preexisting moisture content. Kiln Dried Wood vs Acclimating Moisture - Kiln dried wood has its moisture content reduces and if then sealed with oil and finishes, it will be more resistant to ice damage. However there is a problem... if the wood after it was kiln dried was given time to acclimate to the surrounding moisture content in the air before being sealed - or worse, it was never sealed - then it will have the same moisture content as regular wood anyway. Treated Woods and Specialty Woods - Some woods are treated with resin to create brandname woods like "DiamondWood" and "FutureWood", like those used by the Bear Archery Co. The resins make the wood more durable and water resistant - and thus more likely to be able to take extreme colds. There is also woods like Accoya®* wood, which is treated with acetic anhydride, which increases the wood's durability, "dimensional stability" (whatever that means), resistant to rot, and makes very resistant to both water and cold damage. * Apparently adding ® is more or less a requirement when talking about Accoya® wood. It is mostly used for outdoor purposes. To my knowledge nobody has ever made a bow out of it. It would probably be good for making arrows however. If anyone does make arrows out of Accoya®, please email me some photos and let me know how well they work. Note - Nobody really asked the question, but I felt the topic needed to be discussed and that other people would benefit from learning everything above. I saw you answer archery questions and I have one I am hoping you can answer. I have been thinking of getting into competitive archery and I was wondering if there was any training techniques you would recommend in order to become a better archer that would allow me to progress faster than the Average Joe (or Jane in my case). Basically I want to stand out and I am looking for ways to do that via training. Actually there is many different ways to get a competitive edge through training, but what I am going to recommend is a comprehensive approach because your fellow competitors, if they are remotely serious, are probably doing at least 1 or 2 of these techniques. My impression from what you are asking is that you want to really stand out from the other competitors, and that means doing a lot more than just a few techniques, but instead doing all of them in a more comprehensive manner. Usually 3 to 4 times per week. For some archers this is often the only thing they do. 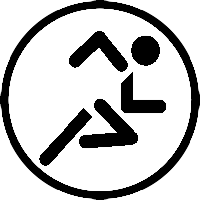 This could be weightlifting, cardio, resistance exercises, yoga and a variety of other methods of improving strength, endurance, balance, posture and so forth. The problem with getting regular exercise is that many people in North America are loath to do it, so it makes sense that a country like South Korea (where regular exercise is more popular and people routinely go hiking in the mountains for the fun of it) wins roughly 75% of all medals at international competitions. So right there, you can see that South Korea and similar countries where regular exercise is popular already has a distinct advantage that allows them to stand out. Another problem with archers is that they often think "Practicing archery counts as exercise, so I don't need to do other kinds of exercise." Thus many archers don't exercise outside of doing archery itself. Unfortunately a lack of comprehensive exercises results in muscle imbalances which actually hinder the archer's endurance and strength. So this idea that professional archers "only need archery to exercise" is a myth. And now we get into the topics that most archers do NOT do, including so-called professionals. So Regular Exercise and Comprehensive Exercises are two different things. One just means regular repetition adding up to a quantity of exercise. Comprehensive means that the exercises you are doing cover a broad range of topics for different purposes. 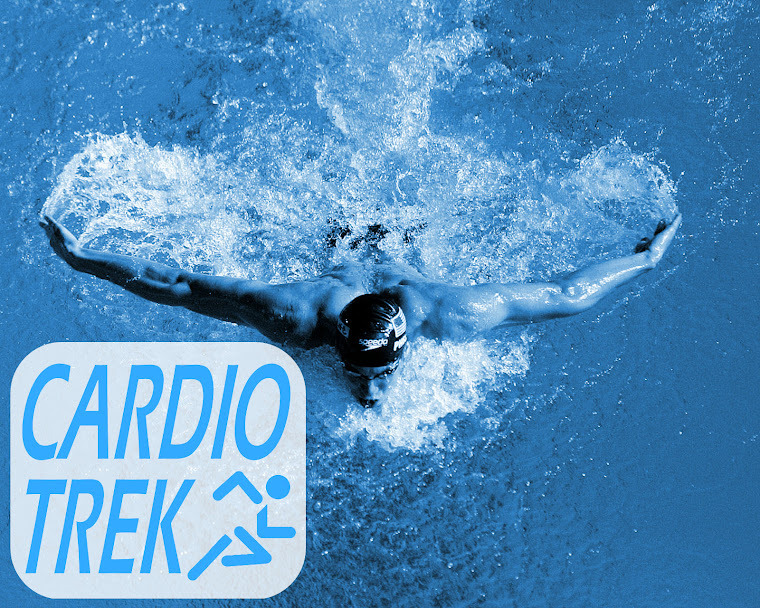 Cardio - Specifically things like jogging or swimming, your goal here is to boost endurance and your heart's strength. Your heart controls the blood flow to your lungs, your muscles, your brain... this increases endurance, strength, and reduces mental fatigue. You want to avoid exercises that focus too much on speed, like sprinting short distances. 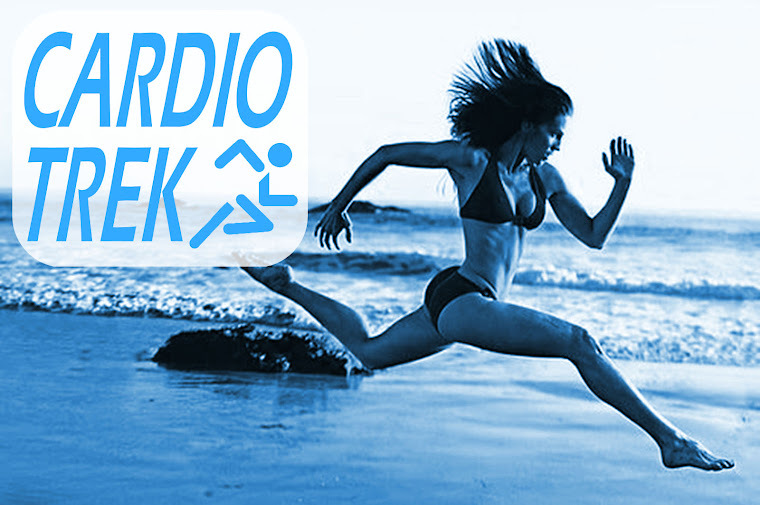 Jogging is more effective because it builds the heart muscles more. Weightlifting and Resistance Exercises - Your goals here are to increase overall physical strength and endurance. This will have some effect on heart strength, but not in the same way that cardio does. This is why you need to do both. The weightlifting/resistance exercises need to be done slowly so that you can build endurance more efficiently. The beauty of this is that you can target specific muscles or muscle groups, but you also need to building the "whole set" so to speak. If you focus too much on building a single muscle, you won't achieve much results. That is why targeting muscle groups is more efficient, so that all the muscles build up cooperatively. Thus, you also need to be comprehensive in your approach and target all the muscle groups. Imagine for a moment an archer who only targets their upper back muscles, and does nothing for their chest, shoulders, arms, lower back - clearly will get a few benefits from building up their back, but their back muscles eventually reach a point where it starts compensating for a lack of strength in other areas. This leads to other muscles becoming weaker and eventually a muscle imbalance develops. This can also lead to bad posture and a host of other problems. This is another thing many archers in North America don't take seriously (and another reason why countries like South Korea have a distinct advantage competitively). Imagine two archers who do the same training regimen, but the only difference is that one archer has a typical North American diet and the other archer has a healthy diet which focuses on protein, vegetables, calcium, vitamins and nutrients. Which one do you think will have more strength, more endurance and a healthier balance of chemicals in their brain (which effects mental conditioning)? The obvious answer is the archer with the healthy diet. And because many archers don't embrace a healthy diet, this is one definite way to get a competitive edge over the 90% of other archers who frankly probably have horrible dieting habits. Honestly, this is very important and I am going to recommend you read the first book most of all. Precision Archery by Steve Ruis and Claudia Stevenson. Read the whole book, even the chapters you don't think will effect you. Just read it all. I have a book titled "High Performance Sports Conditioning", edited by Bill Foran, but I don't think it is still available. Instead I recommend finding a newer book on the same topic of Sports Conditioning. The book I have is basically a big 366 page textbook for athletes who want to do sports conditioning, so you need to be looking for the equivalent. This is unfortunately where money comes into the equation. Having a coach that can advise the athlete on training techniques, exercises, diet, mental preparedness for competitions... this gives the archer a distinct advantage. A good coach will challenge the archer in new ways that will keep their training regimen interesting, interactive and ever changing. You probably won't do so well in the first so many competitions, but your goal here is not to win. It is to learn how to compete and start learning how your mind is effected by the challenges of competition. I know first hand from competing that you can be winning and suddenly flub a shot or two close to the end because I was not mentally prepared for what to do if the wind suddenly picks up and I am getting tired of holding shots while trying to time the wind conditions. That really messes with your head, trying to time a shot in-between wind gusts while you are tired and you grow anxious... and before you know it, you are stressing out and mess up a shot or two because you are basically having an anxiety attack. And that is what makes the difference between coming in first and coming in second. Stress and mental conditioning can make that tiny bit of difference on the score card. The trick I think is to try and remember "It doesn't really matter. Just relax and shoot. Even if you miss, will it really make a big difference to the grand scheme of things?" Because it doesn't matter. Nobody ten years, a hundred years or a thousand years is going to care that you missed a shot. But competing and learning how to accept that defeat when you almost won, and then learning from the experience will make you a stronger and more mentally prepared competitor in the long term. If you practice even on the days when it is cold and rainy, the day will come when it rains during a competition and you will be mentally ready for it. 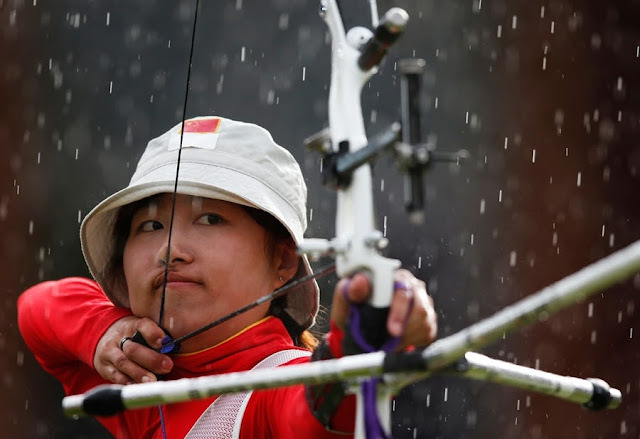 The other archers might not be ready because maybe they never practiced in the rain. But you have, so that makes you the better archer when it comes to shooting in the slop. Best of luck to you in your competitive career! Hello I have a jandao and I was trying to go all over the internet to find the brace height but I'm sol. Do you know what the brace height is if I'm shooting 28#66"? Or where I can ask? Should be approx. 7 or 8 inches. If you cannot be certain of the brace height I recommend experimenting with it to see which brace height gives you the most speed. Don't worry about accuracy yet, just try to see which brace height gives you the most speed from the arrow. When you find that it will also turn out to be the most accurate, but speed is easier to spot. If you have difficulty trying to determine which brace height is fastest by yourself, try having a friend or two stand by and judge the speed of the arrows. 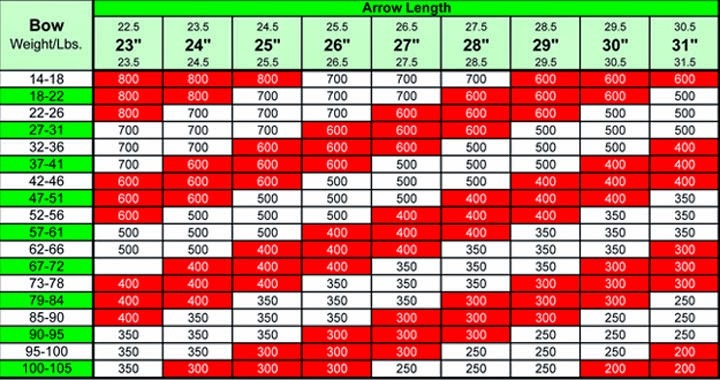 Due to personal preference some people will sometimes prefer a slightly higher or lower brace height, still very close to the "ideal brace height", but within a margin of error that some archers find more comfortable. PS. Regardless of what the poundage is, the brace height on Jandao should still be the same. So it doesn't really matter if it is 28 lbs, 20 lbs or 38 lbs... same ideal brace height. "Hi, my son is very interested in learning archery. However he is just under 15 years of age. I know you have an age minimum, please advise if he is still eligible? Do you have any spots open for Saturdays in the morning? Full package. I retired from teaching archery about a week ago to spend more time with my son while my wife works on her career. My weekends are pretty busy indefinitely so my availability even on weekends is best described as "fully booked". So I am not available any more to teach, regardless of your son's age. Sorry if there is some mixed messages with respect to my Retirement Signature Message. I should update that. However I do have a suggestion. Sign your son up for Boy Scouts (when he turns 15 he can switch to Venturer Scouts, which is for ages 15 to 17). If you have any questions (such as questions about buying archery equipment) let me know and I will help the best I can. Have a good day! Retirement Signature Message - I officially retired from being a personal trainer / sports coach as of August 28th to pursue being a full time stay-at-home-dad while my wife pursues her career. I will be using the time to finish writing an archery book and I may sometimes teach Archery Lessons (weekends only), depending on my availability. 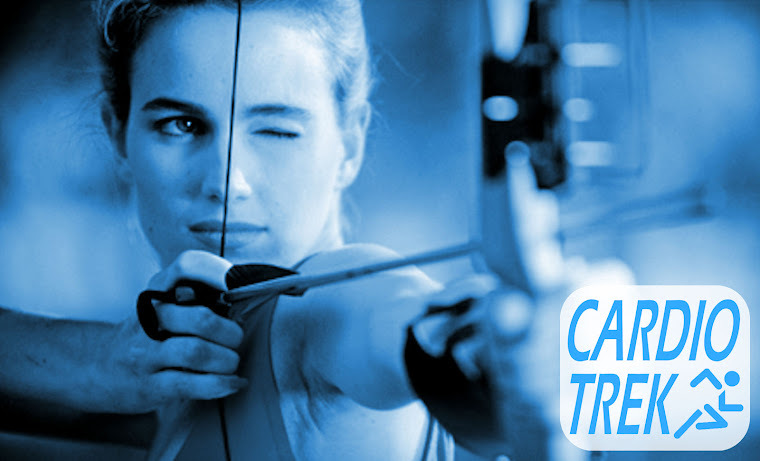 In the meantime please browse free archery tips on CardioTrek.ca, testimonials, and check out what else Cardio Trek has to offer. I'm really interested in getting a decent composite bow off the start (after a few lessons of course). The one I'm thinking of getting is the Oneida Kestrel or Pheonix. Do you think that's a bad idea? I read online that it's ok to go with more expensive bows as it just means I won't grow out of the bow quickly. I know online comments aren't always accurate, so I'd like to hear from a pro. Thoughts? The Oneida Kestrel as seen on the popular "Arrow" TV show. The bow has seen a boost in sales thanks to the show. Well, the Oneida Kestrel/Pheonix are definitely more expensive hybrid recurve compound bows. I only know of two people who even own Oneida bows, as they are pretty rare. I should note that older Oneida's can also be very accurate, judging from the one I shot a few years ago and it was made during the 1990s. I would disagree with the statement that "people don't grow out of more expensive bows as quickly" because obviously there is going to be exceptions to that statement, and since there are so many different kinds of expensive bows, that is quite a few exceptions. 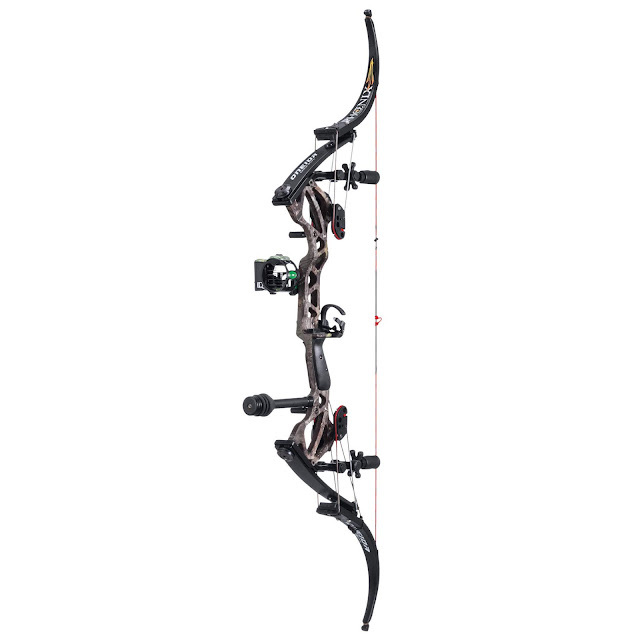 "A compound bow that is easy to adjust, fully adjustable, and has a broad range of power settings, draw length settings, and even comfort settings is the kind of bow a person will not easily grow out of." This weekend I met a guy who had purchased a compound bow with two comfort settings. The first one had a hard Wall, but faster FPS arrow speed, while the second setting was more comfortable with a soft Wall, but slower FPS arrow speed. Modern compound bows are becoming ever more complicated, and this is largely due to manufacturers trying to make bows which are more easily adjustable and have more options for adjustment to suit the user's needs. However not all compound bows are super adjustable. Some are quite the opposite, they are very narrow in how much they can be adjusted because the manufacturer has decided to focus on making a bow super powerful, faster FPS arrow speed, a harder Wall, more let off, extra gadgets for the sake of accuracy, more durability, lighter, better balanced, more expensive materials, etc. There are many ways to make a compound bow more expensive. The ability to not grow out of it too quickly doesn't necessarily factor in to the ways a particular bow is more expensive. With expensive bows there is always the chance a person ends up buying the wrong bow too and ends up regretting it because it was too powerful, not adjustable enough that it was suitable for the individual, etc. If you have additional questions let me know. Have a great day! "Is there a checklist of items I should get when looking for archery equipment [to buy]? 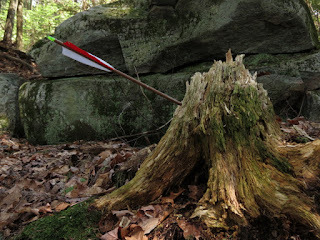 I am looking to shoot recurve." Samick Sage is a very popular beginner recurve. A recurve bow in a poundage you can pull and hold steady for long periods. Avoid any bow you cannot pull and keep steady. When sold a new bow typically comes with a bowstring. 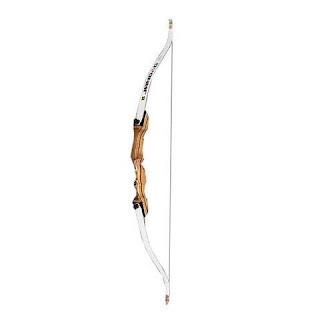 See a list of popular recurve bow brands and models, there are plenty to choose from. A Bowstringer - to string your bow properly, without the risk of damaging it). An archery glove or tab (to protect your fingers properly). The most common style is a 3-finger glove, such as the one made by the American company Neet. Arrow Rest - there are many styles of arrow rests, choose one you like that is within your budget. 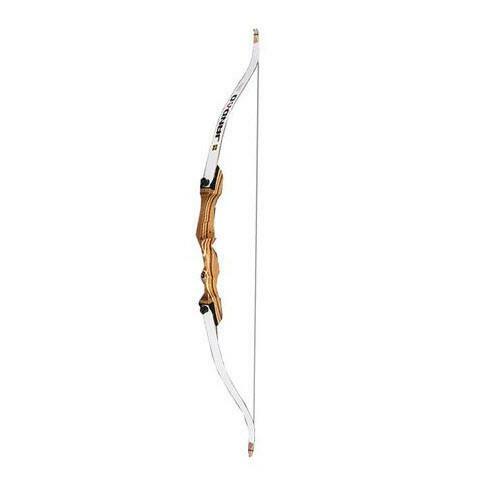 Generally the better quality arrow rests effect the accuracy of your dramatically, so if you are going to invest in something better, spending it on the arrow rest is a good idea. Nock Bead - a tiny brass bead that goes on your bowstring that is used to prevent Stringwalking by accident. Arrowheads - 125 grain field points are the most commonly used. Heavier field points are for shooting at close targets, light field points and for shooting further distances. Arrows that are spined correctly for your bow's poundage. This is actually extremely important. 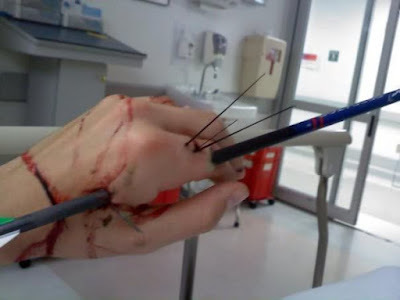 You want the right arrows that suit your bow, both for accuracy reasons and for safety reasons (shooting cheap weak spined arrows on a very powerful bow can cause the arrow to shatter midshot and you can end up with pieces of arrow in your bow arm or hand - see photo below). 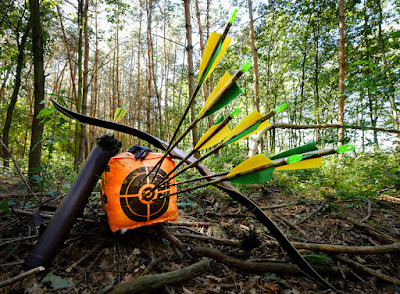 See 3 Frequently Asked Questions about Archery Equipment for more details. Just one reason why you need arrows that are spined correctly for your bow. Optional, but Not a Necessity. See Optional Archery Equipment for more details. Armguard or Bracer - arguably a necessity for some people, but not everyone needs one. Spare Parts for Arrows - spare nocks, spare fletching, fletching glue, spare arrowheads, spare inserts. This is in case you ever need to repair arrows. A quiver of some kind - possibly a back quiver, side quiver, hip quiver, ground quiver - or you can just make your own. Dampeners - puffy balls that make your bowstring quieter. Archery Backpack - to carry your gear in. Bow Sock - for storing a longbow or one-piece recurve in. 3D Targets - for shooting at fake rabbits and such. Portable Archery Targets - for when you don't have anything else to shoot at. Stabilizer - a gadget to help prevent people from canting the bow. Decorative Limbs Skins - purely for decoration. 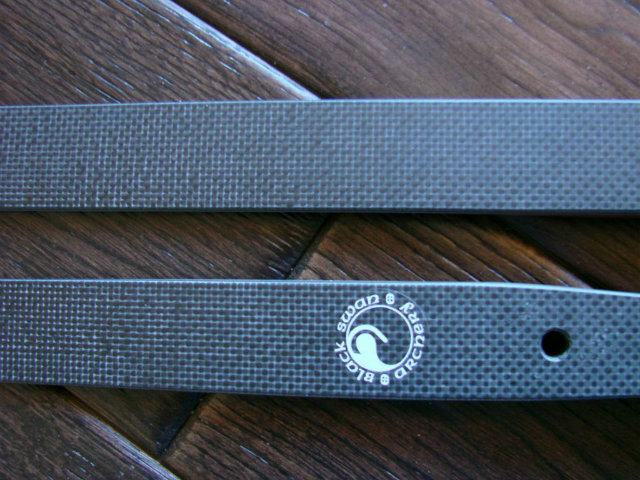 Wrist Strap - so you don't accidentally drop your bow. 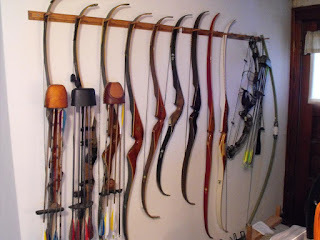 Bow Racks / Bow Stands - for storing your bow when you are not shooting it. Strange Arrowheads - Whistling arrowheads, Tibetan howling arrowheads, blunt arrowheads, glass arrowheads, flint, obsidian - there are quite a variety available. While this is an uncommon question (more suited to an intermediate archer who is ready for their second bow), but it is an important one when it comes to archery equipment. Next we shall answer the questions according to each of these different meanings? When should you get a more expensive bow? This first question really relates more to budget than anything else. Someone who is on a frugal budget might want to limit themselves to buying 1 new bow per year (along with arrows with the correct arrow spine for that bow). 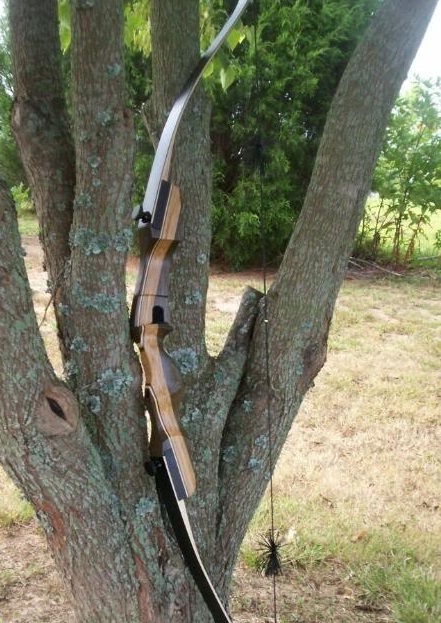 Someone with a more expensive budget could buy a new bow every 6 months or so, or more often, depending on their whimsy. It is their money after all, they can spend it on whatever frivolities they want - like buying a gold plated compound bow, like the one on the right. I suggest 6 months however because I feel that is a good amount of time to get reasonably good with one bow before moving on to the next (assuming the person is practicing regularly). When should you get a higher poundage bow? When your current bow feels too easy and weak because your muscles have grown so much that it now feels easy in comparison. If it feels a little easy, get a bow that is 5 lbs heavier. If it feels very easy, get a bow that is 10 lbs heavier. Not sure which to get? 5 lbs heavier is the safer option. When should you get a bow with faster limbs? This is a trickier question, because faster limbs really comes to style, brand and model. For example Black Swan is a recurve bow manufacturer that makes bows with ceramic-carbon limbs - which are very fast, comparable to compound bow speed. The problem however is sometimes one pro offsets a con. eg. If something is made of more durable materials, it is typically also heavier. If it is both more durable and lighter weight, then it probably be very expensive - however using lighter weight / more durable materials can sometimes be a good way to increase overall speed, so there can also be a speed benefit by using better materials. Note - Most compound bows already shoot in the range of 300 to 350 fps anyway, so you do have to wonder what difference a few extra fps actually makes? Answer: The biggest difference is more accuracy at longer distances - in which case if you are shooting that far then you had better learn how to breathe properly while shooting because a simple error like breathing into your chest and lifting your shoulders can ruin a shot. When should you get a different style of bow? When you feel like trying something new and different. Nobody is forcing you to use one style of bow, and no single style of bow or archery style is "better" than other styles, it is simply different and comes with its own pros and cons. 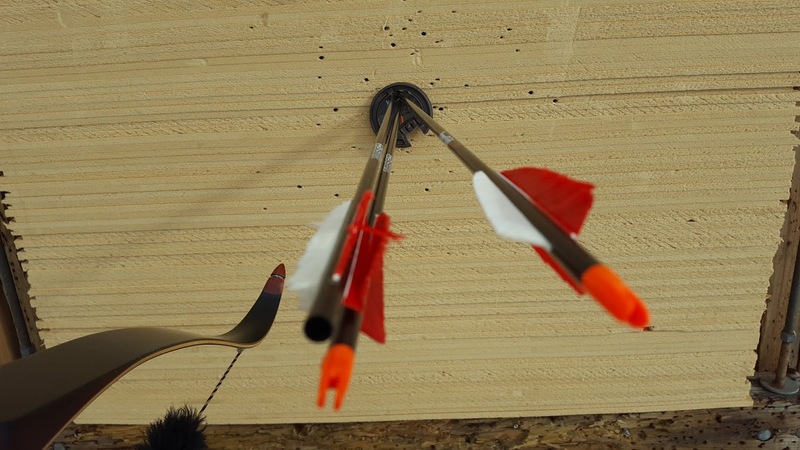 Someone who shoots compound bow and later decides to get into longbows might decide that longbows is something they feel is better simply because it is more enjoyable and challenging. 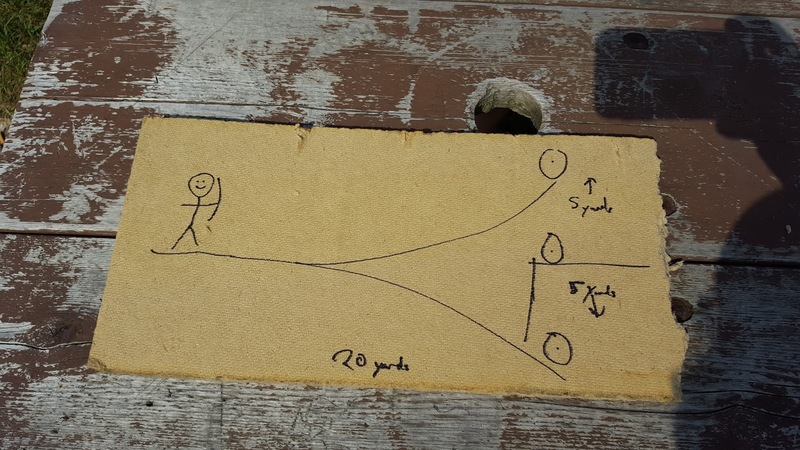 Some people really enjoy the simplicity of shooting longbows. 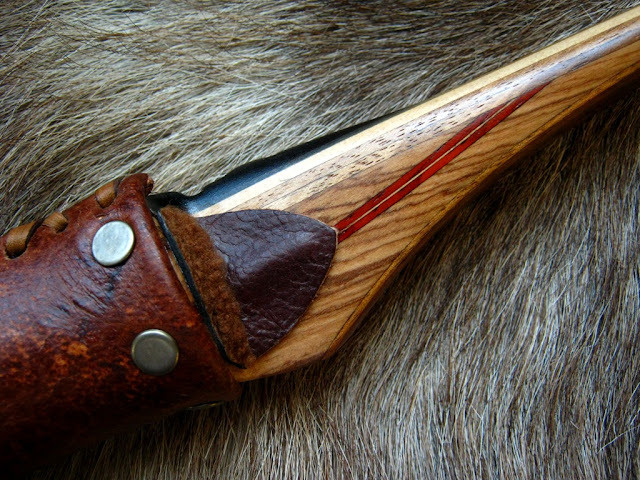 Detail of arrowrest on fibreglass backed laminated wood longbow. Or vice versa, someone who is getting older and wants to keep shooting despite some physical ailments might decide to swap out their old longbow for something different - like a wooden compound bow made by Black Hawk, example below. This way they still get to shoot a beautiful wooden bow, but get to relax a bit more thanks to the 50% let off. I know you are knowledgeable about sports injuries so I thought I should ask you. I have been getting these weird muscle twitches lately in my left arm, just below the elbow on the upper part of my arm. It is only in the left arm which is part of the reason why I think it must be a sports injury. They last for several seconds and you can visibly see the muscles spasm. It is rather weird. I haven't been exercising much lately because it is winter and I am not sure what I could have done to give myself a sports injury, assuming that is what it is. They started yesterday and now it is happening even more today. It is getting worse and I am starting to freak out a bit. Any ideas? Hey Rodney, long time no see. Okay, well you are in luck. I don't think it is a sports injury. I think you are having isolated muscle spasms because you probably haven't been sleeping much lately (I am guessing because of New Years etc, it messes up the sleep patterns for many people). I get them sometimes too, always when I have had a lack of sleep. One time I got the spasms in my left eyelid and it was really annoying. I have found that if I simply take extra time to sleep, maybe even have naps when possible, the spasms go away and everything rights itself. According to my research they can also be caused by high stress (which effects sleep patterns). So that can also be a factor. If they don't go away after lots of sleep, then you should definitely consult a doctor. "Oh damn. I think you are right. I have been staying up for the last two nights really late and playing Skyrim. Like staying up til 4 AM, that sort of thing. That game is really addictive. Okay, I just need to go to sleep sooner and stop playing Skyrim so late at night. It all makes sense now. Glad to hear my educated guess was accurate. I was wrong about the New Years Eve, but correct about the lack of sleep. Go sleep more!!! Do you teach archery lessons during the winter? How much for 3 lessons? Are the lessons outdoors? I recommend also reading my Archery Lessons Syllabus so you have a better idea of what each of the lessons will be focusing on. 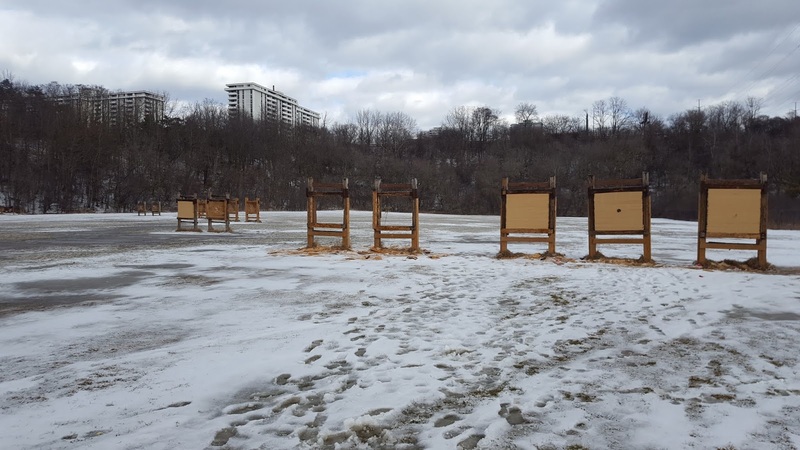 While Winter Lessons do have a stronger focus on skills that are useful during the winter, the overall scope of the lessons remains the same as the normal lessons. $60 for 90 minutes; 3 Lessons - $170; 5 Lessons - $270; 10 Lessons - $520. $90 for 90 mins; 3 Lessons - $255; 5 Lessons - $405; 10 Lessons - $780. All equipment is provided during archery lessons. Winter Archery Gloves are also provided in a variety of sizes. Buying your own equipment is not mandatory, but it is optional. I also teach Archery Biathlon (combination of cross country skiing and archery), so if a person is interested in learning that they just have to ask. 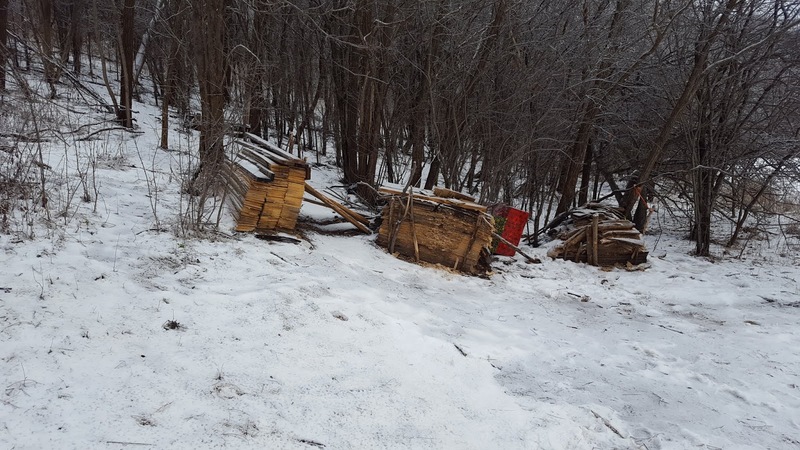 I do not provide the skis or poles however, so that is something you would need to purchase or already own if you are interested in doing Archery Biathlon. Snowshoes are handy if the snow is really deep. Again, not mandatory. Wearing temperature appropriate clothing is mandatory. I also strongly recommend bringing a thermos filled with a hot drink. I’m interested in [archery] lessons, is there a syllabus? Focus of lesson is on building quality form and good habits. Focus of lesson is to be using consistent back strength, which is key to long distance accuracy. Focus of lesson is to get rid of remaining bad habits that hinder accuracy. Lessons 5 to 10 also typically include a short lecture and/or demo on topics dealing with equipment maintenance, technical skills, etc.